Stochastic multicolor labeling is a popular technique in neuroscience and developmental biology. 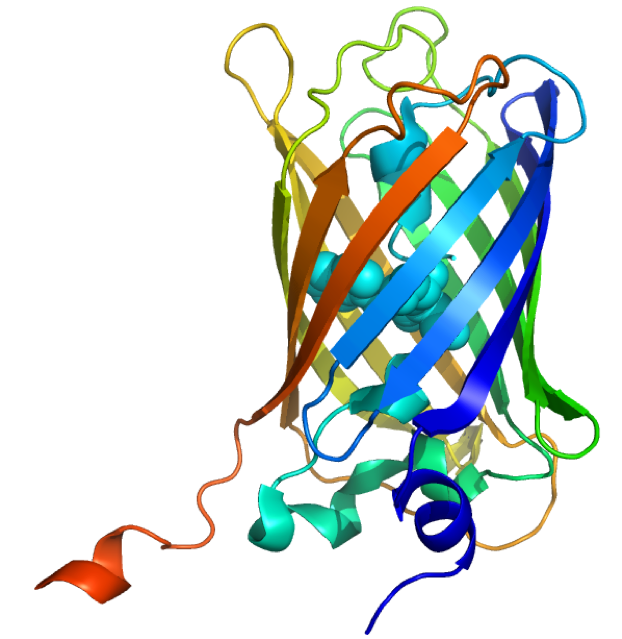 This type of cell labeling technique involves the introduction of a transgene construct containing fluorescent proteins (XFP) of different colors to label an organ or entire organism. 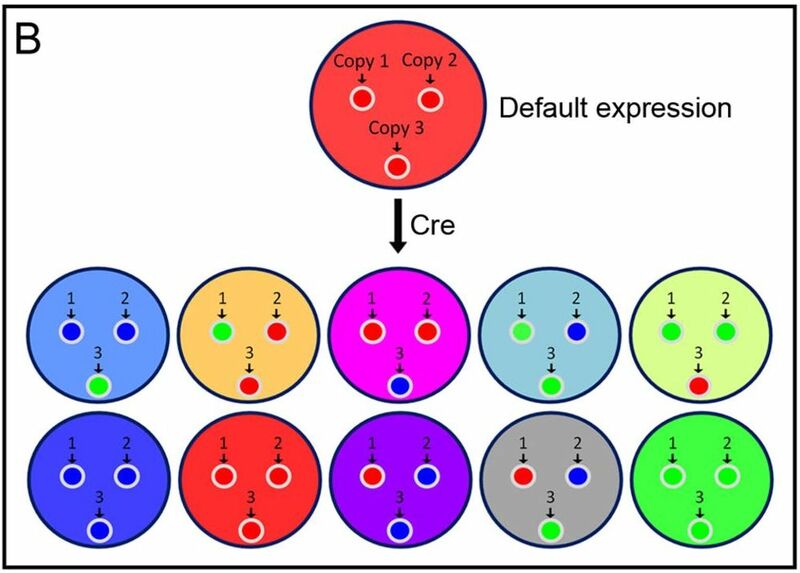 Because each cell can have multiple copies of the transgene that will recombine independently, cells may acquire one of a variety of colors when a combination of XFP are expressed. Each cell remains the same color for its entire lifetime and daughter cells retain the same color, allowing for the fate mapping of cell populations over time. The ability to track single cell dynamics at the organism level has been made possible by tools that allow cells to become persistently fluorescent during development. 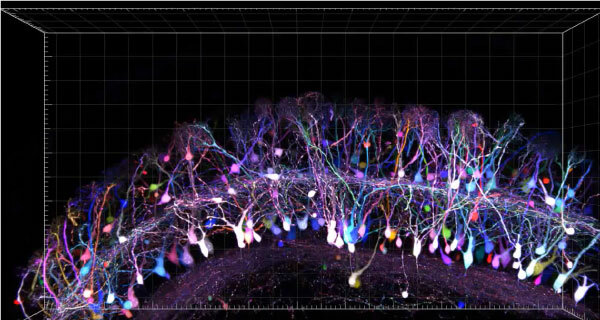 Stochastic multicolor labeling systems, many based on Brainbow, now exist for a variety of species, cell types, and research applications. If you’re been following Addgene on #souptwitter or if you just enjoy a warm meal on a winter day, you should be happy to learn that many DNA-based reagents are named for soup ingredients! From pSOUP to mCherry, satisfying ingredients reagents permeate the molecular biologist’s kitchen lab - and scientists using aptamers might know this best, as most fluorescent aptamers are named for a fruit or vegetable! This post was contributed by Richi Sakaguchi from Kyoto University, and Marcus N. Leiwe and Takeshi Imai from Kyushu University. Stochastic multicolor labeling is a powerful solution for discriminating between neurons for light microscopy-based neuronal reconstruction. To achieve stochastic multicolor labeling, Brainbow used the Cre-loxP system to express one of the three fluorescent protein (XFP) genes in a transgene. When multiple copies of the transgene cassette are introduced, stochasticity will result in a combinatorial expression of these three genes with different copy numbers, producing dozens of color hues (Livet et al., 2007; Cai et al., 2013). However, the brightness of Brainbow was inherently low. This is because the stochastic and combinatorial expression of fluorescent proteins is only possible at low copy number ranges, resulting in low fluorescent protein level.